Gainesville turns contaminated land into a contemporary public greenspace to serve as the city's “Central Park'. As more cities are facing the realities of remediating the scars of an industrial past, brownfield sites are increasingly being converted into a hybrid of public space combined with stormwater treatment facilities like Tulsa’s Guthrie Green. In Gainesville, FL a multitude of partners led by the Gainesville CRA restored one such brownfield site into Depot Park, a centrally located stormwater park in the city’s urban core near Depot Avenue and Main Street. Once the industrial hub of Gainesville, the park land had hosted a variety of rail corridors and industrial uses such as coal gasification and other manufacturing plants. Where industry once dominated, the site now features walking paths, interpretive exhibits, and native vegetation creating a natural North Florida wetland landscape while on-site ponds naturally treat stormwater and reduce contaminants entering Paynes Prairie. A look at the transformation of Depot Park per Teri Hasbrouck, Environmental Consulting & Technology, Inc via Florida Brownfields Association. The Gainesville Downtown Train Depot operated from the 1860s to the 1940s, with the first railroad passenger service in 1859. Nearby, the Gainesville Gas coal gasification plant was operating from 1887 to 1952, providing gas for street gas lights, home lighting and stoves. Starting in the 1880s, commercial activity also occurred in the area, including a cotton gin, flour mill and wooden ware (furniture) factory. Historically, coal manufactured gas plant (MGP) sites have produced some of the most contaminated sites in the downtown areas of Florida’s cities. Housekeeping practices were very sloppy at the plants and as a result, soil and groundwater contamination was common at MGPs. On July 26, 1995, the US EPA released an announcement that listed the first pilot projects under the federal Brownfields Economic Redevelopment Initiative. Two years later, the EPA awarded a $200,000 Regional Brownfield Pilot grant to the City of Gainesville to conduct an environmental site assessment on the MGP site. Originally called the East Gainesville Sprout Project, it aimed to assist redevelopment of the site into a stormwater treatment facility with the amenity feature of a park. The site received designation as a brownfield in 2000. Then in 2002, the Florida Department of Environmental Protection (FDEP) executed a Brownfield Site Rehabilitation Agreement to remediate contamination and complete the redevelopment activities. The original site consisted of 20 acres however, as additional contamination was identified on adjacent and nearby parcels, the remediation area grew to 37 acres. Redevelopment began with an effort to characterize this complex site. First, various sources of contamination were identified. Then the extent of soil and groundwater contamination was determined and a remedial action plan was prepared. Ultimately, redevelopment of the site included the involvement of nine federal, state and local government agencies, six major stakeholders, and funding from eleven sources including the original 1997 Brownfield Assessment Grant. Contractors excavated and hauled over 255,000 tons of contaminated soil while 73 million gallons of groundwater were treated. 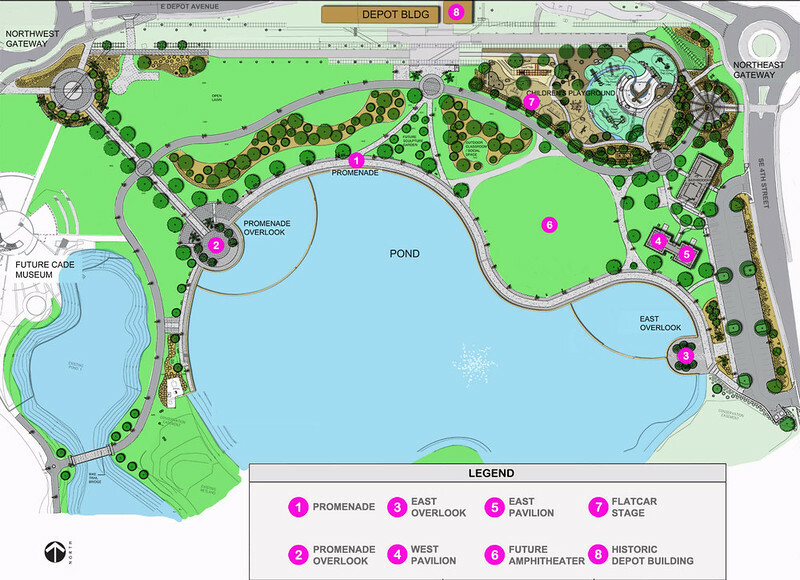 This ambitious reclamation ties together environmental restoration and infrastructure improvements with historic preservation and community greenspace. 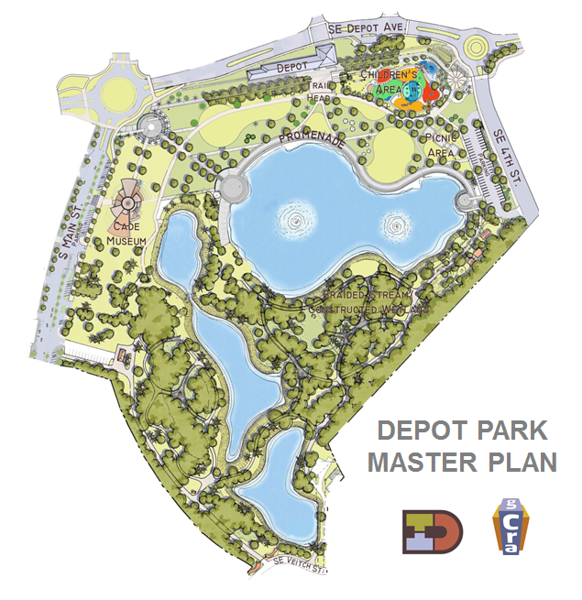 Depot Park envisions a contemporary public greenspace to serve as the city’s “Central Park” while creating a regional stormwater facility for use by developers of the University Avenue/Main Street area in downtown Gainesville. The facility treats stormwater runoff from approximately 89 acres of the surrounding area. The park has expanded to include amenities such as playgrounds, bike trails, walking paths, and interpretive exhibits as well the restored Train Depot Building for small retail shops. The Cade Museum, a three-story, 45,000 square foot community facility, will also be located within the park footprint. Depot Park will become the greenspace amenity for downtown Gainesville used by future generations as an area to meet, play and hold special events.